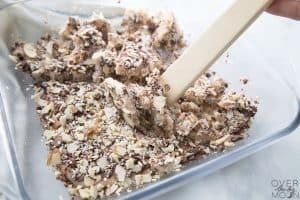 My friend, Megan, introduced us to this Homemade Almond Roca and I was blown away that you could make it yourself and with NO candy thermometer! It is now one of our favorite Christmas treats! It makes the perfect gift for friends, teacher and neighbors during the holidays too! 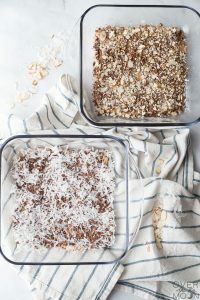 I altered her recipe a little to make a Coconut version, because one of our boys has a nut allergy! 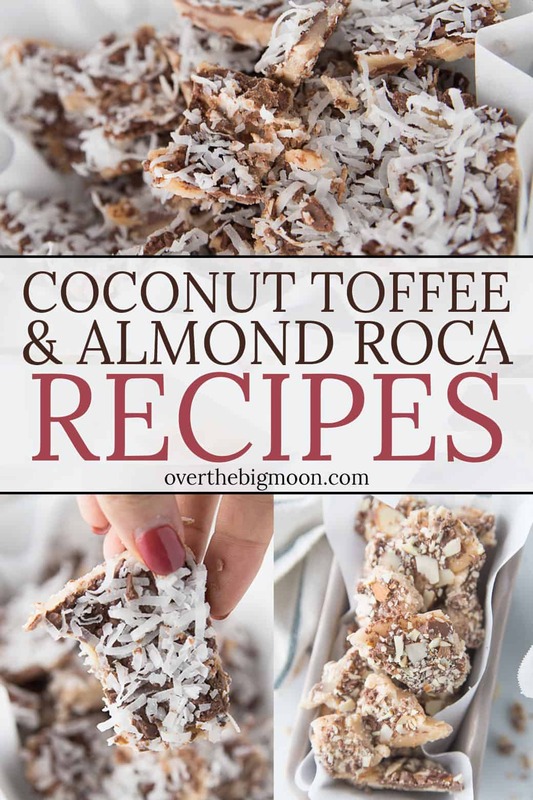 The Coconut Toffee is easily as popular as Almond Roca now too! 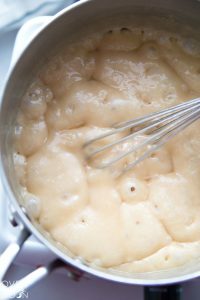 The easieset base toffee recipe that does not require a candy thermometer! Combine the butter, water and sugar to a saucepan and heat on med-high. It should look like it's lightly bubbling most of the time. Keep an eye on it and stir it every few minutes. While the toffee is stirring, chop the chocolate super fine. You want to get the chocolate very fine. 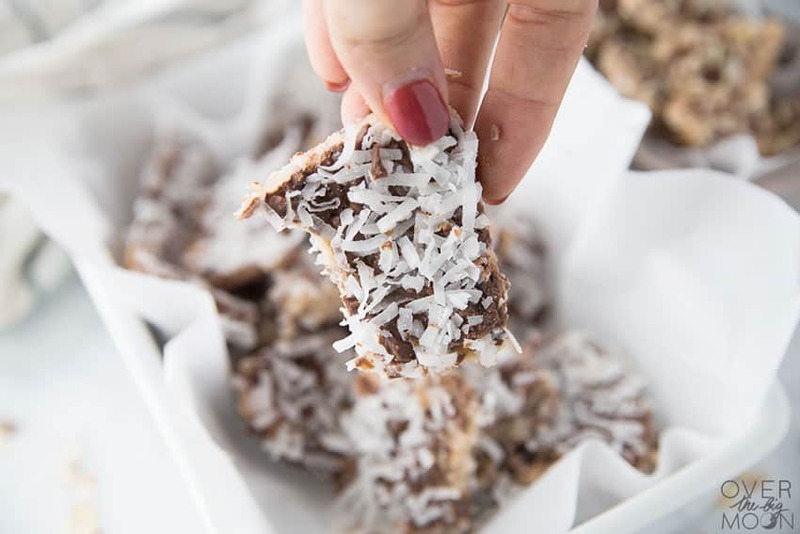 Make sure you hustle with your chopping, because you need it and your choice to topping (coconut or almonds) done and in the bottom of the glass pan before the toffee is ready! If you're only doing one type of toffee, then layer the chocolate and topping in the bottom of a 9"x13". If you're going to make both types of toffee, then sprinkle a little over 1/2 of the chocolate between two 9"x9" pans and then add almonds to one pan and coconut to the other! After about 15 minutes the toffee should start to change color and darken. You want to let it cook until it gets to be the color of a brown lunch sack. 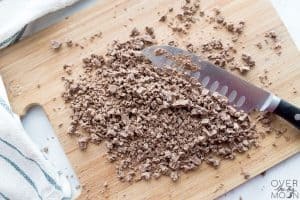 Remove it immediately from the stove when it gets that color and pour it as evenly over the chocolate as possible. Then immediately sprinkle the chocolate over the top. I find its easier to use a spoon since it's so fine. 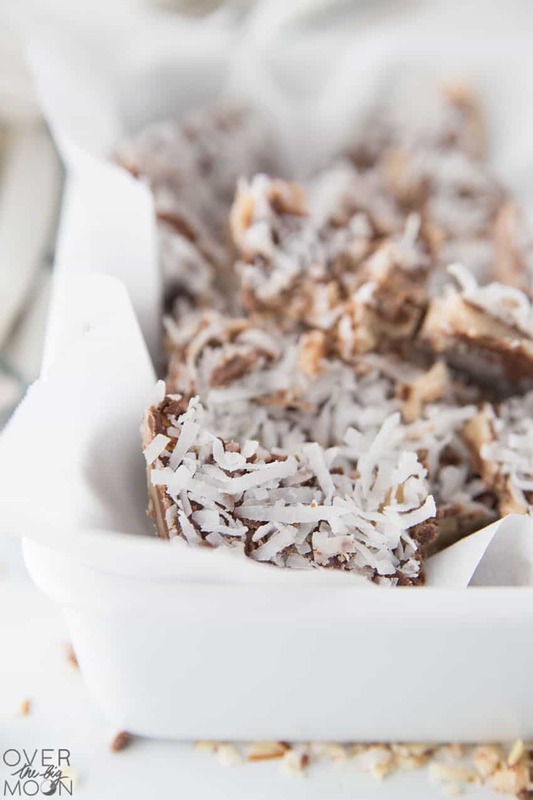 Then sprinkle the other half of the almonds or coconut and lightly push it down into the toffee. Refrigerate for a few hours and allow to cool completely. Find something hard (like a wooden spoon) and smash it! It helps to kind of get a corner out and then it breaks a little easier. ENJOY! 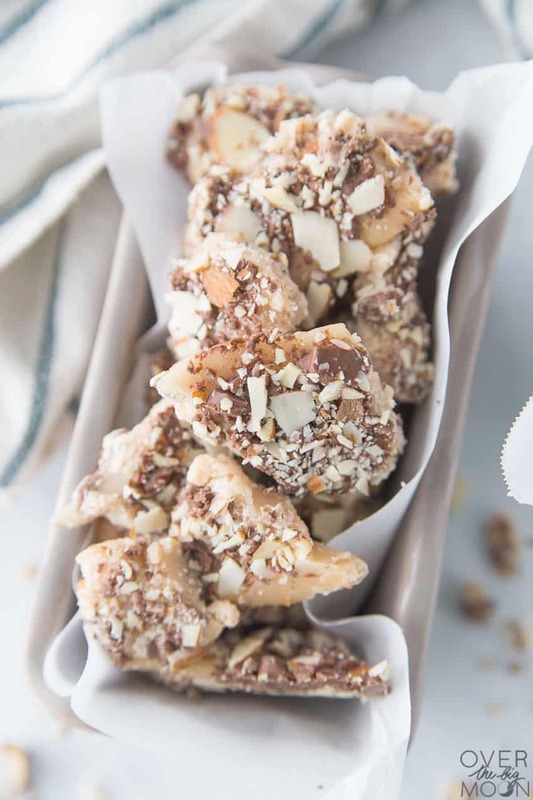 This toffee recipe also makes the perfect Holiday Neighbor Gift! This makes a great gift for neighbors too! 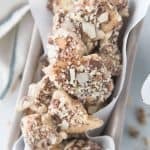 If you love this Holiday treat, make sure and check out these other Holiday recipes and Neighbor Gift Ideas! 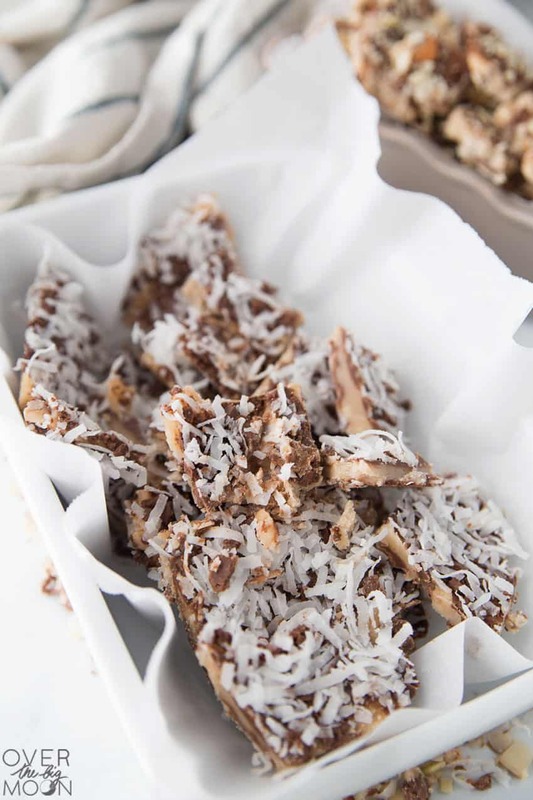 If you love this Almond Toffee and Coconut Toffee recipe, then I’d love it if you pinned the image below!